This is a superb piece made by Michael Hunter for Twists Glass shortly after he established Twists Glass in1998. 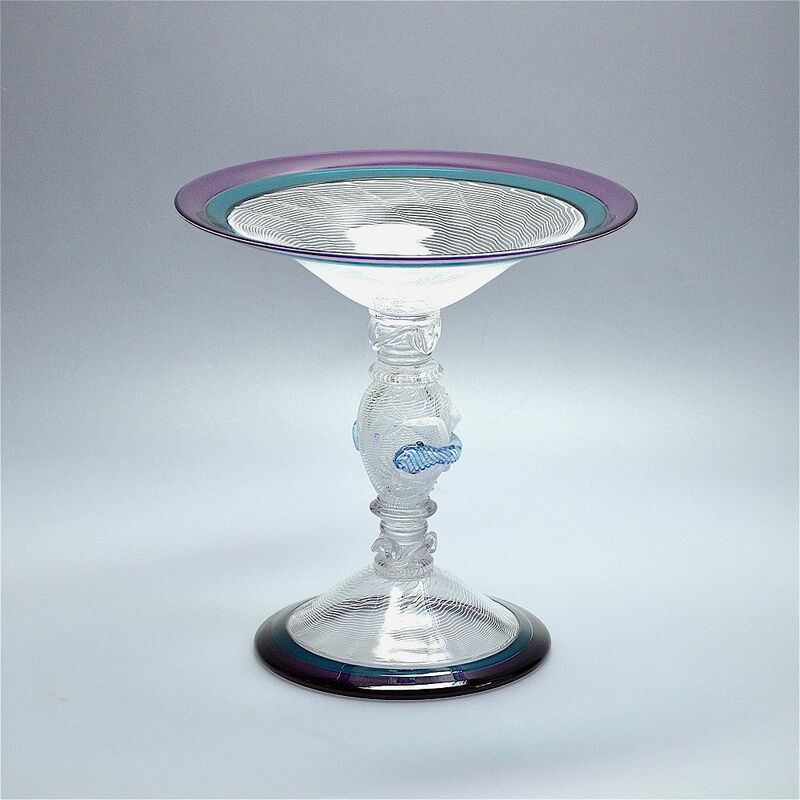 The round domed foot has two outer incalmo layers of purple & dark turquoise glass and the third inner incalmo layer is in white latticino cane. The central stem has a bulbous latticino centre crawling around which is a lizard with a white & turquoise zanfirico cane body and white zanfirico cane legs. The top and bottom of the central stem are in clear glass with clear glass slip trailing. The central stem supports a round concave bowl that has two outer incalmo layers of purple and dark turquoise and an inner layer of latticino cane. In the centre of the bowl is Mike's personal "MH" signature cane. The base is scratch signed "M Hunter Twists 16" and has the Twists Glass studio label. Although this piece is dated 2016 it is much earlier and was made not long after Mike established Twists Glass. We have seen this piece and its sister, which is also on the website, for as long as we have known Mike & Sue. There are certain things that are not on general view but we always want to see what Mike has tucked away! On our last visit we managed to persuade Mike to release both tazzas - they had not been signed and so Mike signed them and dated them for 2016 - the year of their release!